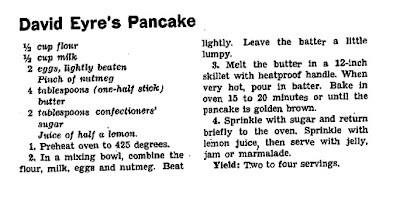 David Eyre's Pancake was a staple weekend breakfast when I was a kid, and it continues to be. It was one of the first things that I taught W. to make. My sister recently confessed that she'd made three of them for dinner one night when her husband wasn't home - one for her and one for each of her two bigger children - so she wouldn't have to share! It's a great recipe. I usually skip the sugar/lemon finish and just eat it with jam. W. likes to eat his with maple syrup - he seems to think that all "pancakes" need syrup. The recipe also scales up to 3 eggs or down to 1 pretty well – pick an appropriately sized pan, and just keep the proportions to 1 egg + 1/4 c flour + 1/4 cup milk. Josh Friedland wrote about it in The Food Section awhile ago. He's got some comments from Claiborne about the pancake and the original article, and his own nostalgia about growing up eating it. In essence, it's yorkshire pudding without the beef drippings (and the roast beef!). This sounds very similar to "Dutch Baby" which I discovered last year. One of our favorites! Ha! Three years later and I come back to the same post. I have often made two of these, so I don't have to share (as much) with the kids. It's the perfect "meal" at the end of a long day when no one is in the mood to cook. Sounds similar to the German pancakes I make. I'm bookmarking this one to try once I get my cast iron pan out of storage.